I’m always happy when a program makes backup quick and easy. 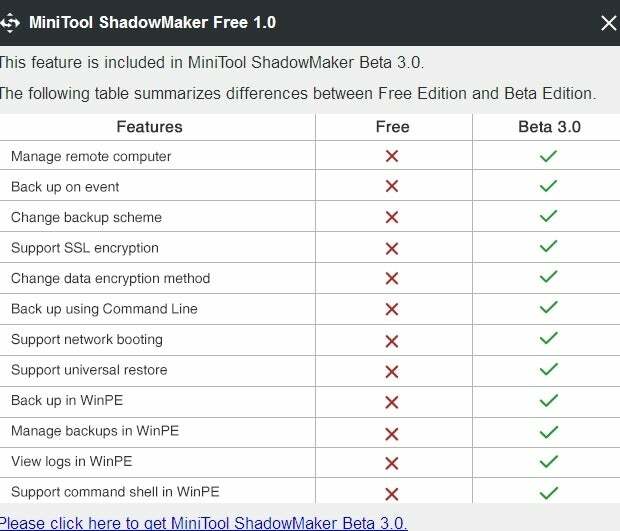 MiniTool ShadowMaker makes me very happy. Being available in a free version that has all the features the average user needs makes me even happier. I’d say ecstatic, but hey, this is backup, not true love or world peace we’re talking about. 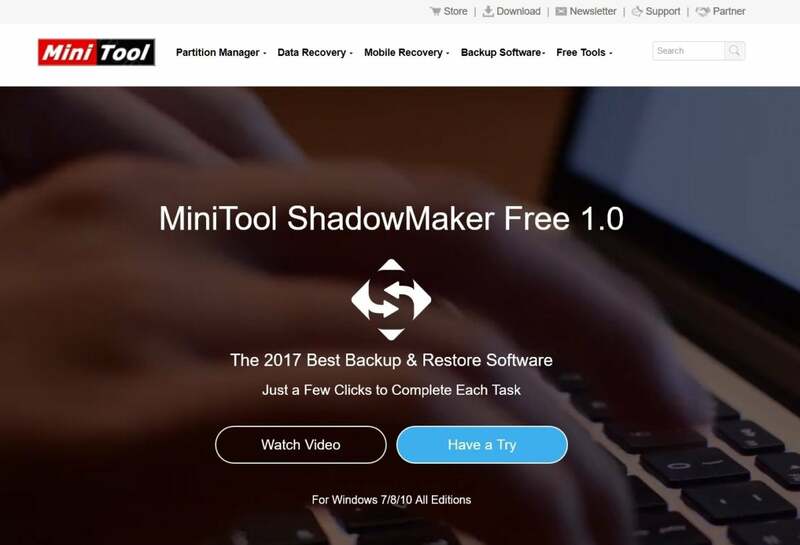 MiniTool ShadowMaker is a 70MB download, and installs with just one process running in the background—its scheduler. As it’s a Windows-only program, and creates bootable media in the Windows PE (Pre-install Environment) format, I’m not sure why the company didn’t leverage the existing Microsoft scheduling. However, it seems to be fairly common for programs to go their own way instead. Shadowmaker’s interface is clean, logical, and not unattractive. The ShadowMaker interface is nicely done up in the Windows 10 style. Functionally, it’s the tabbed dialog that’s popular for step-by-step tasks, and it’s exceptionally logical and easy. ShadowMaker backs up full partitions and can also clone entire drives. There’s no file copy as such, but most users, at least the less technical types, are better off backing up everything. It’s a numbing experience to restore a backup and realize that what you are really missing, isn’t there. Don’t ask us how we know that. The free version of ShadowMaker performs incremental backup, which backs up any changes since your last backup. This isn’t the same thing as a differential backup, which backs up everything that’s changed since your last full backup, ignoring any partial backups that might have happened in between. You’re free to limit the number of backups. The program will cull older ones to make room for the new ones, actually removing backup “sets,” i.e., the full and incremental portions of a prior backup. 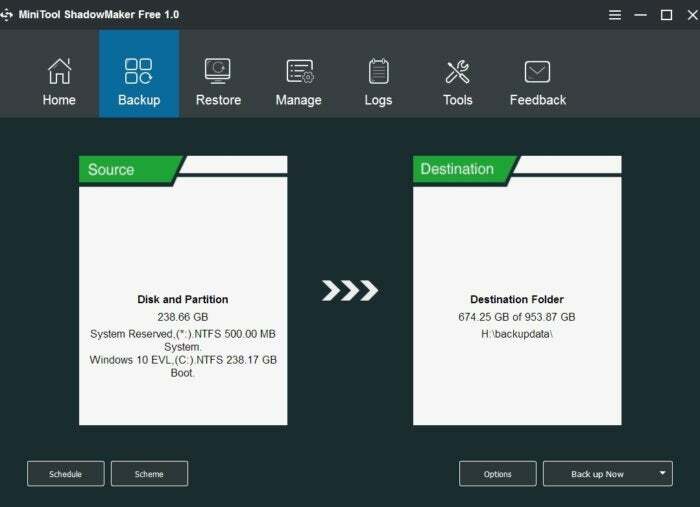 Beyond choosing the partitions (drive letters) to back up; you can manage the level of compression; define email alerts and notifications; choose between backing up only used sectors or all of them; decide to shut down the computer post facto; and password-protect the images. The relationship between the free version and the pro version that’s currently under development is a bit sketchy at this point. 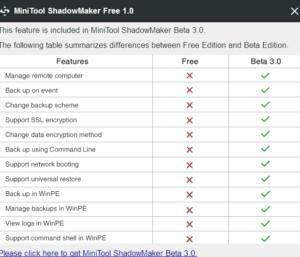 There’s no pay version on the MiniTool site, just a free beta 3.0 with the pro features. You can see the features that are missing from the free version in the image below or at the product pages online. These features are available in the 3.0 beta, which will be pay eventually. One beta/pro feature of interest to the average user is the ability to create full (other than the original) and differential backups. As noted above, a differential backup contains all the data changed since the last full backup, while incremental backups contain only the data that’s changed since the last backup of any type. Incremental backups are faster, but differential backups restore faster. Another significant beta/pro feature is the universal restore, which means you can restore to hardware that’s not identical or extremely similar to the device from which you backed up. If your old PC died, for instance, and you want to move the old files to a new PC, this can be important. That said, we often recommend that users take advantage of the clean install on their new PC and reinstall programs, then simply copy the data back. The beta and pay versions can also back up from remote PCs on the local network, given the proper permissions. We were pleasantly surprised at how quickly ShadowMaker imaged our Windows and system reserved partitions: well under 5 minutes for about 120GB worth of data. Of course, it was copying from and writing to NVMe SSDs, so most users will see significantly slower times. We will, however, state unequivocally that it won’t be the program’s fault. Mounting and dismounting the proprietary images was quick and easy as well, though we still prefer Paragon’s trick of creating .VHDs that Windows itself can mount. All in all though, we were impressed with ShadowMaker’s performance. Yes, that’s a joke. 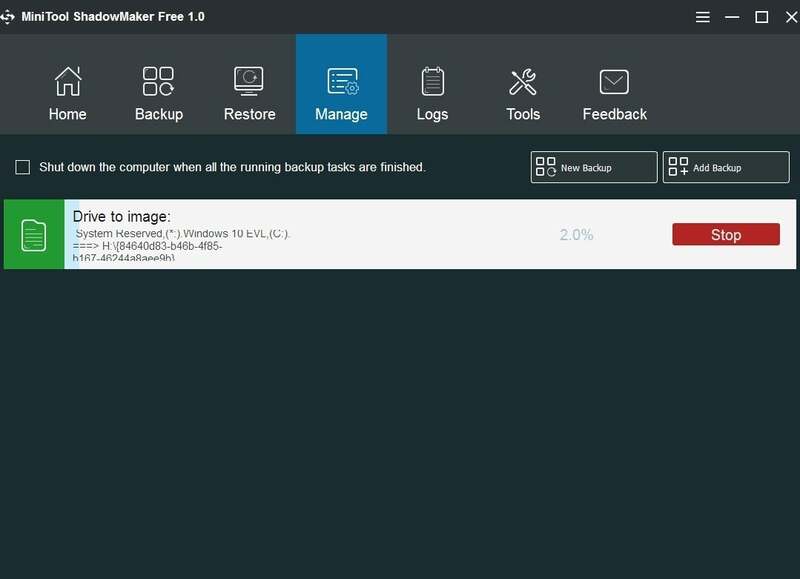 While not as versatile as Aomei Backupper, and perhaps not as well known as Macrium Reflect, ShadowMaker is a super-competent, nicely rendered imaging program. It works and it’s free. Have at it, and take a look at the pro version when it appears.